Published by Cyril Huze August 26th, 2017	in Builders, Editorial and Events. 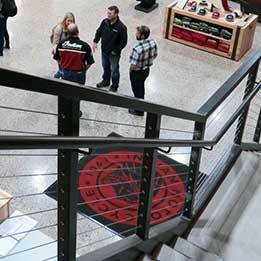 Indian Motorcycle just opened an Experience Center at its Spirit Lake manufacturing facility. Based in America’s heartland, the Spirit Lake Experience Center is a free offering for motorcyclists looking to connect with the iconic American motorcycle brand. 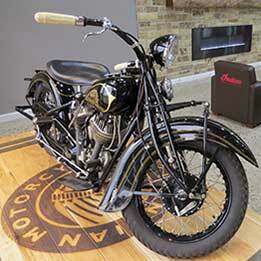 The Indian Motorcycle Spirit Lake Experience Center will showcase current and historic Indian motorcycles and offer complementary behind-the-scenes tours of its world-class production facility. 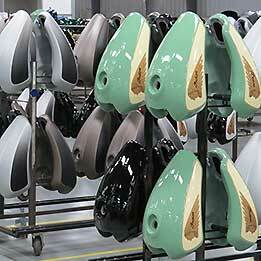 Visitors will observe the assembly process that’s conducted from start-to-finish with robotic machinery and witness new Indian motorcycles come right off the line. The Spirit Lake Experience Center will also serve as a venue for private events. Menneto welcomed the new Experience Center with Spirit Lake employees, friends and family members during an honorary ribbon-cutting ceremony. Motorcyclists attending the Boji Bike Rally will have the opportunity to visit the Spirit Lake Experience Center on Friday and Saturday, August 18 and 19, from 9am-2pm. The Experience Center will be open for complementary tours on Mondays and Fridays from August 21 through November 3, 2017. Tours will reopen in 2018. Tours will be conducted through appointments only, which can be made by calling Indian Motorcycle Spirit Lake at 712-336-6955. And while this six year old company is trying to convince everyone that they’re 117 years old, I just saw a video of a new CVO dyno’d. 10 more ft-lbs and 20 more hp than a TS 111. Oops. Fortunately for Indian a little niche company like Harley doesn’t have throngs of after market companies working on upgrades to separate them even further…. I simply could not purchase one of these motorcycles, because of that quote. I heard they also have a wing of the building called “The Hall of Broken Dreams and Promises” where you can gaze upon the Victory brand they created, neglected, and ultimately destroyed. I particularly enjoy the gas tank collection, where Victory refused to believe from 2006 through 2016, that people did not want neon green flames or random stripes on their gas tank anymore. Steve Menneto can do you a really good deal on the Brooklyn Bridge too! Yeah, Menneto is engaging in a bit of creative salesmanship. Certainly no worse than our current president does every day. However, the proof is in the pudding. If Menneto can keep Indian alive and growing, I think he can actually earn his way to the Indian name. If and only if he succeeds in keeping Indian alive for the long term. My Dad road an Indian back in the 50s so some of these people don’t know squat about Indian bikes. Its true they were out of production for a long time. But the Indian Motorcycle is like a fine Brandy, you cant kill that great taste. And you cant quit on a great Bike. I just wish I could afford one now. Just rely on Porsche a Chinese companies to help them. I’ll stick with my 117 year old company thanks. So Porsche is Chinese now? Wow. Those numbers for the torque and horse power are creative at best, Harley doesn’t support those numbers on their CVO’s. if polaris couldn’t make a profitable product with victory, what makes menneto think polaris can with indian? the customer end points of the supply chain, i.e. a consistently good customer service experience across victory dealerships hurt victory. really tough issues to work through. Cmon guys get over it. Do you think that Harley would of released the new models if they never had serious competition. Just spent a month in your country on a Indian and own one here in OZ. We can’t ride with a patch on our back here in QLD, or the cops will bust us and then we have to prove we are not criminals. They took my shotgun, that my dying grandfather gave me, and my deceased fathers cadet rifle as well. Because they deemed me a risk. Just a couple of drink driving charges as a young fellla. Not one violent crime. We have to wear helmets on bicycles. You live in one of the best free countries in the world, and we support you through hell and high water. So please stop the wining A bit of competition goes a long way. Steve (and owning a 2015 Roadmaster) has convinced me to consider the Ultra Limited HD or a new Yamaha Venture. The new Chief line …dogs as far as performance, Polaris will bail on you, Harley never will. They will always be around. The Venture closely matches the amentities that I have on my Vision (heated contact points, power windshield). Time will tell. is that the INDIAN mike wolf sold to the indian reps at Sturgis? I agree with my fellow countryman Highly Sprung, quit bashing Indian and enjoy the benefits of having true competition for HD. I for one would make a point of going through their experience centre if I was in town, sound like it would be fun. Let’s see what they got ? If I am out that way.